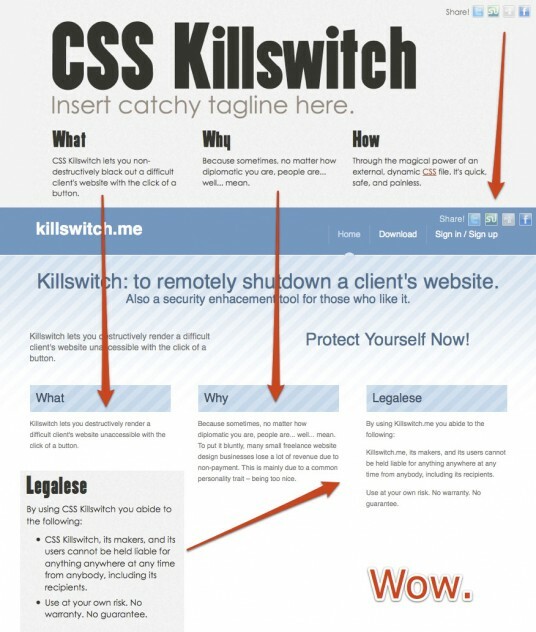 CSS (short for “Cascading Style Sheets”) is the markup that makes the internet look the way it does. CSS Killswitch works by creating a unique, inconspicuous, and innocuous stylesheet that you’ll link the potentially problematic client’s site to. Should negotiations go south and passwords get changed before you receive payment, that stylesheet can be activated to superficially black out the site, returning to you the upper hand. When relations return and you’ve received payment, the killswitch is easily deactivated and its traces removed. 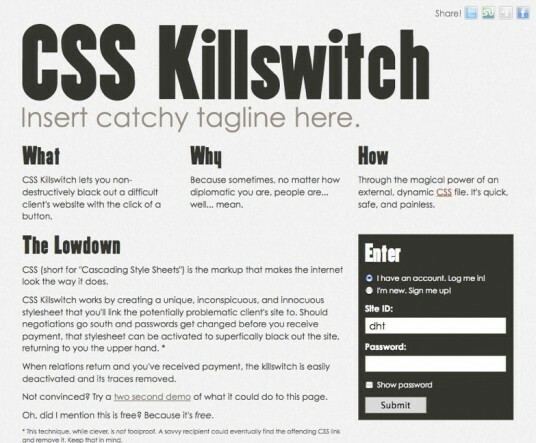 My attempt at a web killswitch was predated by a couple others, so the idea is not new. Furthermore, my CSS version is far from ideal. In fact, of all the ways to do something like this, mine is probably the easiest to diagnose and override… but it is the easiest to implement. Reactions were mixed. Most tweets were positive. A couple were incredulous. A few were negative. The reddit discussion was lively and, surprisingly, mostly civil. Lastly, I have never used this on any of my clients’ websites and I never intend to. Almost all of the people I’ve made sites for were very rad, savvy, intelligent people. In no way will this ever be 1% as good as a contract, and it undoubtedly has some serious ethical and legal implications. Mostly, like just about everything else I do, this was an experiment to see if I could do it. Tommy – Bill here, I wrote the PHP Kill Switch you linked to above. Just wanted to say thanks for the link, and that your CSS solution is pretty slick and damn user friendly. Nicely done! You do realize that nowhere in the world can any notice absolve you from claims from third parties, right? So your “legalese” is pretty useless. To put this into perspective: I can’t contract with my friend that you have to sign over all rights to Killswitch to me. (Pretty obvious, right?) You were not a party to the contract, so you cannot unilaterally be bound to its terms. Exactly the same for anyone affected by your code. You can require that the web designer using it exempts you from responsibilities, but you in no way bind the rest of the planet. Link is in japanese.. cant work. Hi, I'm Tommy, I make and ship things for the internet, and iamnotagoodartist is my blog. You can read more about me, contact me, view my portfolio, subscribe to this blog, or get social with me on Twitter, GitHub, and Forrst. 2019. Tinker tinker. Holler atcha boi.